Available at Amazon and Nova. 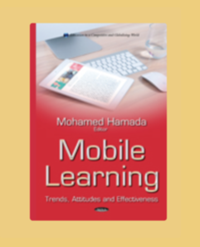 M. Hamada and A. Tabot, Introduction to Mobile Learning. In Mobile Learning: Trends, Attitudes and Effectiveness. M. Hamada, (Ed. ), pp. 1-15, NOVA Science Publisher, ISBN: 978-1-63483-429-2, Nova Science Publishing 2015. Tiako F., and M. Hamada, Interactive Multimedia Mobile Learning Based on Cloud Computing. In Mobile Learning: Trends, Attitudes and Effectiveness. M. Hamada, (Ed. ), pp. 55-104, NOVA Science Publisher, ISBN: 978-1-63483-429-2, Nova Science Publishing 2015. Ogbonna A., and M. Hamada, Recommendation of Web Content Using Mobile and Web Technology. In Mobile Learning: Trends, Attitudes and Effectiveness. M. Hamada, (Ed. ), pp. 105-113, NOVA Science Publisher, ISBN: 978-1-63483-429-2, Nova Science Publishing 2015. M. Hamada, Aree M., and K. Tufan, An Example of a Multimedia Mobile-Based Framework. In Mobile Learning: Trends, Attitudes and Effectiveness. M. Hamada, (Ed. ), pp. 173-185, NOVA Science Publisher, ISBN: 978-1-63483-429-2, Nova Science Publishing 2015. 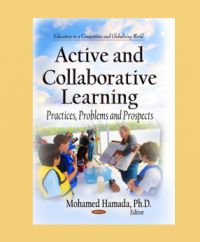 A. Tabot and M. Hamada, Introduction to Active and Collaborative Learning, In “Active and Collaborative Learning: Practices, Problems and Prospects”, M. Hamada, (Ed. ), pp. 1-15, NOVA Science Publisher, ISBN: 978-1629480664, Dec. 2013. K. Oyibo, and M. Hamada, Active, Collaborative and Mobile Enhanced (ACME) Learning Framework, In “Active and Collaborative Learning: Practices, Problems and Prospects”, M. Hamada, (Ed. ), pp. 91-138, NOVA Science Publisher, ISBN: 978-1629480664, Dec. 2013. A. Sahabi and M. Hamada, An Active Multimedia Learning System on Smartphone for Automata Theory, In “Active and Collaborative Learning: Practices, Problems and Prospects”, M. Hamada, (Ed. ), pp. 167-190, NOVA Science Publisher, ISBN: 978-1629480664, Dec. 2013. 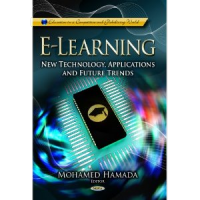 H. El-Bakry and M. Hamada, Enhancing Adaptive Mobile E-Learning by using Cloud Computing, In “Active and Collaborative Learning: Practices, Problems and Prospects”, M. Hamada, (Ed. ), pp. 139-165, NOVA Science Publisher, ISBN: 978-1629480664, Dec. 2013. A. Tabot, K. Oyibo, and M. Hamada, E-Learning Evolution: Past, Present, and Future, In “E-Learning: New Technology, Application and Future Trend”, M. Hamada, (Ed.) ISBN: 978-1-62618-961-4, pp. 1-32, NOVA Science Publisher 2013. Mohamed Hamada and Hazem El-Bakry, A Developed Watermark Technique for Distributed Database Security. In Computational Intelligence in Security for Information Systems, pp. 226-235 Springer-Verlag. 2010. H. Bakry and M. Hamada, A New Implementation for Neural Networks in Fourier-Space. Chapter 12, in Abo et. al. (Editors), Foundations in Computational Intelligence, Vol. 1, Learning and Approximation: Theoretical Foundations and Applications, Studies in Computational Intelligence, ISBN: 978-3-642-01081-1, Springer-Verlag, 2009. Mohamed Hamada and Mohamed Hassan, Artificial neural networks and particle swarm optimization algorithms for preference prediction in multi-criteria recommender systems. Informatics journal (an ESCI Indexed Journal) Vol. 5(2), pp: 1-16, 2018. Mohamed Hassan and Mohamed Hamada, Genetic Algorithm Approaches for Improving Prediction Accuracy of Multi-criteria Recommender Systems. The International Journal of Computational Intelligent Systems (an SCI Indexed Journal) Vol. 11(1), pp: 146-162, 2018. Mohamed Hassan and Mohamed Hamada, Performance Comparison of Feed-forward Neural Networks Trained with Different Learning Algorithms for Recommender Systems. The International Journal of Computation (an SCI Indexed Journal) Vol. 5(3), pp: 40-57, 2017. Mohamed Hamada and M. Hassan, AAn Enhanced Learning Style Index: Implementation and Integration into an Intelligent and Adaptive e-Learning System. EURASIA Journal of Mathematics, Science and Technology Education (an SSCI Indexed Journal) Vol 13(8) pp: 4449-4470, 2017. Mohamed Hassan and Mohamed Hamada, A Neural Networks Approach for Improving the Accuracy of Multi-criteria Recommender Systems. The International Journal of Applied Science (an SCI Indexed Journal) Vol. 7(9), pp: 868-885, 2017. Mohamed Hamada and M. Hassan, An Interactive Learning Environment for Information and Communication Theory. EURASIA Journal of Mathematics, Science and Technology Education (an SSCI Indexed Journal) Vol. 13(1) pp: 35-59, 2017. Mohamed Hassan and Mohamed Hamada, A Framework for Recommending Learning Peers to Support Collaborative Learning on a Social Network. International Journal of Simulation Systems, Science & Technology (United Kingdom Simulation Society) Vol. 17(35) pp: 30-43, 2016. Mohamed Hamada, Turing Machine and Automata Simulators. Elsevier Procedia Computer Science. Vol. 18, 2013, pp. 1466-1474, Elsevier 2013. Hazem E. and M. Hamada, Adaptive E-Learning for Data Encoding and Computer Networks Based on Learner’s Style. International Journal of Computer Networks and Security, Recent Science Publisher. Vol. 22, No. 12, pp. 333-342, 2013. Mohamed Hamada and Kosuke Nishikawa, A Study of a Learning Style Index to Support Intelligent and Adaptive Learning Systems, In “Intelligent and Adaptive Educational-Learning Systems, Vol. 17, No. XII, pp. 109-132, Springer-Verlag, 2012. Mohamed Hamada and Sayota Sato, A Learning System for a Computational Science Related Topic. Elsevier Procedia Computer Science Vol. 9. 2012, pp. 1763-1772, Elsevier 2012. Mohamed Hamada and Sayota Sato, A Game-based Learning System for Theory of Computation Using Lego NXT Robot. Elsevier Procedia Computer Science Vol. 4, 2011, pp. 1944-1952, 2011. Mohamed Hamada, Virtual Environment for an Ants-like Model. The International Journal of Virtual Reality, Vol. 9, No. 4, Dec. 2010. Mohamed Hamada, Computer Engineering Education. In Wiley Encyclopedia of Computer Science and Engineering, (B. Wah, Edit. ), John Wiley and Sons, Inc. pp. 997-1012, 2009. Mohamed Hamada, An Integrated Virtual Environment for Active and Collaborative e-Learning in Theory of Computation. In the IEEE Transactions on Learning Technologies, Vol. 1, No. 2, pp. 1-14, 2008. Mohamed Hamada, An Example of Virtual Environment and Web-based Application in Learning. International Journal of Virtual Reality, Chinese Academy of Science, Vol. 7 No. 3, pp. 1-9, 2008. Mohamed Hamada, A Web-based Tools for Active Learning in Information Theory. ACM SIGCSE Bulletin Vol. 39, No. 1, pp. 60-66, 2007. Mohamed Hamada and Kazuhiko Shiina, A Classroom Experiment for teaching Automata, ACM SIGCSE Bulletin, Vol. 36, No. 3, Sept. 2004. Mohamed Hamada, A Study and Simulation of Random Walks, World Scientific and Engineering Transactions On Systems, Issue 2, Vol. 2, pp. 358-366, 2003. M. Hamada and Y. Nakamura, Visual Simulation of Ants Behavior, World Scientific and Engineering Transactions On Computers, Issue 1, Vol. 2, pp. 111-116, 2003. Aart Middeldorp, Taro Suzuki, and Mohamed Hamada, Complete Selection Functions for a Lazy Conditional Narrowing Calculus, Journal of Functional and Logic Programming, Vol. 2002, No. 3, (43 pages), 2002. Mohamed Hamada and Fayed Ghaleb, Study and an Efficient Implementation of Some Symbolic Computation Algorithms, Journal of Advances in Modeling and Analysis, France, Vol. 6, no. 4, pp. 15-29, 2001. Mohamed Hamada, Operational Semantics of Functional Logic Languages, Journal of Software, Chinese Academy of Science, Vol.12, No.9, pp.1279--1286, 2001. Mohamed Hamada, Strong Completeness of a Narrowing Calculus for Conditional Rewrite Systems with extra variables, Electronic Notes in Theoretical Computer Science, Vol 31, No. 1, Elsevier Science, 2001. Mohamed Hamada, Aart Middeldorp and Taro Suzuki , Completeness Results for a Lazy Conditional Narrowing Calculus, Australian Computer Science Communications, Vol 21, No. 3, 2000. Mohamed Hamada and Tetsuo Ida, Deterministic and Non-deterministic Lazy Conditional Narrowing and their implementations, Journal of Information Processing Society, Japan, Vol. 39 no. 3 March 1998. Mohamed Hamada and Tetsuo Ida, Implementation of Lazy Narrowing Calculi in Mathematica, SIGSAM Bulletin Volume 31, no. 2, June 1997. Ismaila L., M. Hamada, S. Adeshina, Adaptive Multimedia Learning Framework with Facial Recognition System. 13th IEEE International Conference on Electronics Computer and Computation, (ICECCO-2017), Nile University, Abuja, Nigeria, November 2017. M. Hassan and M. Hamada, Performance Analysis of Neural Networks-based Multi-criteria Recommender Systems. IEEE 2nd International Conference on Embedded Information Technology, Information Systems and Electrical Engineering (ICITISEE-2017), Yogyakarta, Indonesia, November 2017. M. Hassan and M. Hamada, A Computational Model for Improving the Accuracy of Multi-criteria Recommender Systems. IEEE 11th International Symposium on Embedded Multicore/Many-core Systems-on-Chip (MCSoC-2017), Hana Square (Science & Engineering Complex), Korea University, Seoul, South Korea, September 2017. M. Hassan and M. Hamada, Smart Media-based Context-aware Recommender Systems for Learning: A Conceptual Framework. IEEE International Conference on Information Technology Based Higher Education and Training (ITHET) Ohrid, Macedonia, July. 2017. Hassan and M. Hamada, Improving Prediction Accuracy of Multi-criteria Recommender Systems Using Adaptive Genetic Algorithm. IEEE International Conference on Intelligent Systems, London, UK, 2017. Mohamed Hamada and Mohamed Hassan, A Multimedia Learning Environment for Information Theory. IEEE International Conference on Teaching, Assessment, and Learning for Engineering (TALE), Bangkok, Thailand Dec. 2016. Mohamed Hassan and Mohamed Hamada, Enhancing Learning Object Recommendation Using Multi-Criteria Recommendation Systems. IEEE International Conference on Teaching, Assessment, and Learning for Engineering (TALE), Bangkok, Thailand Dec. 2016. Mohamed Hassan and Mohamed Hamada, Rating prediction operation of multi-criteria recommender systems based on feedforward network, 2nd international conference on Applications in information technology, University of Aizu, Aizuwakamatsu, Japan, Oct. 2016. Mohamed Hamada and Tanko Yahaya, A Cloud-based Java Compiler for Smart Devices. IEEE International Conference on Information Technology Based Higher Education and Training (ITHET) Istanbul, Turkey, Sept. 2016. Mohamed Hamada and Mubaraka Sani, Adaptive Learning Framework, IEEE International Conference on Information Technology Based Higher Education and Training (ITHET) Istanbul, Turkey, Sept. 2016. Mohamed Hassan and Mohamed Hamada, Recommending Learning Peers for Collaborative Learning Through Social Network Sites. IEEE International Conference on Intelligent Systems, Modeling and Simulation (ISMS) 2016. Mohamed Hassan and Mohamed Hamada, Learning System and Analysis of Learning Style for African and Asian Students. IEEE International Conference on Teaching, Assessment, and Learning for Engineering (TALE ) pp: 83-87, 2015. A. Tabot and M. Hamada, Mobile Learning with Google App Engine, IEEE (CCLS) MCSoC, pp. 63-67, IEEE, 2014. A. Ali, K. Tufan and M. Hamada, A Multimedia Mobile-based Learning Framework for Kurdish Language, IEEE ITHET 2014, pp. 112-118, IEEE 2014. A. Tabot and M. Hamada, The Role of Multimedia Learning Systems in the Nigerian Higher Educational Landscape, IEEE ITHET 2014, pp. 91-97, IEEE 2014. M. Ebner, C. Prettenthaler, and M. Hamada, Cloud-based service for eBooks using EPUB under the Aspect of Learning Analytics, IEEE (CCLS) MCSoC, pp. 116-122, IEEE, 2014. M. Hamada and T. Mitsui, A Mobile-based Multimedia System for Learning Japanese, ACM MoMM 2013, pp. 369-375, ACM Dec. 2013. K. Oyibo and M. Hamada, A Framework for Instantiating Native Mobile Multimedia Learning Applications on Android Platform, ACM MoMM 2013, pp. 589-595, ACM Dec. 2013. Hazem El-Bakry and Mohamed Hamada, Fast Diagnosing of Pediatric Respiratory Diseases by using High Speed Neural Networks. IJCNN 2013, IEEE International Conference in Neural Network, Dallas, TX, USA, pp. 1-8, IEEE 2013. T. Arreytambe, M. Hamada, S. Yusuf, O. Kiemute, Pervasiveness of E-Learning And Its Impact on The Nigerian Tertiary Educational System, 7th International Technology, Education and Development Conference), Valencia (Spain), March, 2013. Arreytambe Tabot and Mohamed Hamada, A Multimedia Learning System for Selected Topics of Physics. In the IEEE ITHET 2012 Istanbul, Turkey, pp. 215-223, IEEE 2012. Mohamed Hamada, A Learning System for Audio Compression. ACM iiWAS 2012, pp. 328-332 ACM 2012. Mohamed Hamada, Hyato Namae, A Multimedia Learning System for MP3 Audio Compression. In the ACM SIGCSE ITiCSE 2012, pp. 397, ACM 2012. Mohamed Hamada, Learning Style Model for e-Learning Systems. AMT 2012, Lecture Notes in Computer Science (LNCS) Vol. 7669, pp. 186-195, Springer-Verlag. 2012. Mohamed Hamada and Kosuke Nishikawa, Learning Style Index: Implementation and Integration into e-Learning Systems. Proc. of the IEEE International Conference in Engineering Education, pp. 59-65, 2010. Mohamed Hamada, Sayota Sato: Lego NXT as a learning tool. ACM SIGCSE ITiCSE 2010, pp. 321-322, 2010. Mohamed Hamada, Kosuke Nishikawa: Web-Based Enhanced Learning Style Index with Integration into an e-Learning System. ICWL 2010, Lecture Notes in Computer Science (LNCS) Vol. 6483, pp. 101-110, Springer-Verlag. 2010. Mohamed Hamada and Sayota Sato, Simulator and Robot-based Game for Learning Automata Theory. Edutainment 2010, Lecture Notes in Computer Science (LNCS) Vol. 6249, pp. 428-436, Springer-Verlag. 2010. Hazem El-Bakry and Mohamed Hamada, A Novel Watermark Technique for Relational Databases. WISM-AICI 2010, Lecture Notes Computer Science (LNCS) Vol. 6870 pp. 132-141 Springer-Verlag. 2010. Hazem M. El-Bakry, Mohamed Hamada: A Developed WaterMark Technique for Distributed Database Security. CISIS 2010, pp. 173–180. Springer-Verlag Berlin Heidelberg 2010. Time Delay Neural Networks. IJCNN 2009, IEEE International Conference in Neural Network, Atlanta, USA, pp. 757-763, IEEE 2009. Hazem El-Bakry and Mohamed Hamada, Fast Principal Component Analysis for Face Detection Using Cross-Correlation and Image Decomposition. IJCNN 2009, IEEE International Conference in Neural Network, Atlanta, USA, pp. 751-756, IEEE 2009. Mohamed Hamada, Pushdown Automata Simulator. Edutainment 2009, Lecture Notes in Computer Science (LNCS) Vol. 5670, pp. 328-338, Springer-Verlag. 2009. Mohamed Hamada, Ants-like Agents: a Model and Analysis Based on Natural Ants Behavior. KES-amasta 2009, Lecture Notes in Artificial Intelligence (LNAI) Vol. 5559, pp. 20-29, Springer-Verlag. 2009. Hazem El-Bakry and Mohamed Hamada, Fast Identification of Important Information in DNA Sequence by using High Time Delay Speed Neural Networks. KES 2009, Lecture Notes in Artificial Intelligence (LNAI) Vol. 5712 pp. 333-341 Springer-Verlag. 2009. Mohamed Hamada, Communication Model Simulator: Tools for Active Learners. Proc. Of the 8th IEEE International Conference on Advanced Learning Technologies, Madrid, Spain, pp. 283-288, July. 2008. Hazem El-Bakry and Mohamed Hamada, A New Implementation for High Speed Normalized Neural Networks in Frequency Space. KES 2008, Lecture Notes in Artificial Intelligence (LNAI) Vol. 5177 pp. 121-132, Springer-Verlag. 2008. Mohamed Hamada, Web-based Environment for Active Computing Learners. ICCSA’08, Lecture Notes in Computer Science (LNCS) Vol. 5072, pp. 516-529, Springer-Verlag 2008. Mohamed Hamada, An Interactive Simulator for Information Communication Models. EDUTAINMENT08, Lecture Notes in Computer Science (LNCS), Vol. 5093, pp. 88-99 Springer-Verlag 2008. Mohamed Hamada, Supporting Materials for Active e-Learning in Computational Models. ICCS’08, Lecture Notes in Computer Science (LNCS), Vol. 5102 pp. 678-687, Springer-Verlag 2008. H. Bakry and M. Hamada, New Fast Decision Tree Classifier for Identifying Protein Coding Regions, ISICA’08, Lecture Notes in Computer Science (LNCS) Vol. 5370, pp. 499-509, Springer-Verlag 2008. Mohamed Hamada, Computer Engineering Education. In Wiley Encyclopedia of Computer Science and Engineering, (B. Wah, Edit. ), John Wiley and Sons, Inc. pp. 997-1012, 2008. Mohamed Hamada, Web-based and Interactive e-learning tools for Automata Theory, Proc. Of the 7th IEEE International Conference on Advanced Learning Technologies, Niigata, Japan, pp. 877-880, July. 2007. Mohamed Hamada, A Virtual Environment for Active Learning in Theory of Computation. EDUTAINMENT07, Lecture Notes in Computer Science (LNCS) Vol. 4469, pp. 422-432, Springer-Verlag 2007. Mohamed Hamada, A Model and Analysis for Ants-Like Agents, Proc. Of the 2nd IEEE International Conference on Information and Communication Technologies: From Theory to Applications, pp. 1127-1138, April. 2006. Mohamed Hamada, Visual Tools and Examples to Support Active E-Learning and Motivation with Performance Evaluation. EDUTAINMENT06, Lecture Notes in Computer Science LNCS Vol. 3942, pp. 147-155, Springer-Verlag 2006. Bhagyavati, Ghemri, Taylor, and M. Hamada, Experiences Involving Undergraduates in Research, Proc. of the 14th International Conference on Telecommunication Systems – Modeling and Analysis, help at Penn State University in October 2006. Mohamed Hamada, Performance Evaluation of Visual Tools in Classrooms, Proc. Of the 6th IEEE International Conference on Information Technology Based Higher Education and Training, pp. 14-18, July. 2005. Rahman B. Mat and M. Hamada, Lookahead Algorithm for Selective Sampling in Active Naïve Euclidean Object Learning, Proc. of the Inter. Conference on Humans and Computers, The University of Aizu, 2004. I. Aminova, M. Hamada, and E. Morozov, Regenerative Simulation and Visualization of Some Queuing Networks, Proc. of DCCN’03, University of Moscow, pp. 73-78, 2003. Mohamed Hamada and Evsey Morozov, Network Performance Evaluation Based on Ants-Like Algorithm, Proc. of the XXIII International Seminar on Stability Problems for Stochastic Models, The Public University of Navarre, in Pamplona, Spain, pp. 81-83, 2003. M. Hamada and Y. Nakamura, Visual Simulation of Ants Behavior, Proc. of The Mediterranean Conference on Modeling and Simulation, University of Mediterranean of Reggio Calabria, Italy, June 25-27, 2003. Mohamed Hamada, A Study and Simulation of Random Walks Proc. of Intr. Conference on Applied Mathematics and Computer Science, Rio de Janeiro, Brazil, Oct. 21-24, 2002. Hamza Ali and Mohamed Hamada, A Simulation of Hand Written Characters using Neural Networks Techniques, Proceedings of the International Conference in Neural Networks and Applications, pp. 23-28, Switzerland, February, 2002. Mohamed Hamada, Visual Simulation and Analysis of Random Walk in d-Dimensional Lattice, Proc. of the 4th St. Petersburg Workshop on Simulation, pp. 245-252. St. Petersburg State University, Russia, 2001. Proc. of the International Conferences of Artificial Intelligence, pp. 179-184, Nevada U. USA, June 2001. Mohamed Hamada, Improving Search Space in a Narrowing Calculus, Proc. of the 10th International Conferences on Computing and Informatics, Kuwait University, Nov. 2000. Mohamed Hamada, Functional Logic Languages: Semantics and Implementations (Invited paper), Proc. of the 4th World Multi-Conferences on: Circuits, Systems, Communications and Computers, Athens, Greece, July 9-16, 2000. Mohamed Hamada and Tetsuo Ida, A Deterministic Lazy Conditional Narrowing and its implementation in Mathematica, Proceeding of the International Theorema workshop, 9-10 June, 1997, RISC, Austria. Mohamed Hamada and Tetsuo Ida, Implementation of Lazy Narrowing Calculi in Mathematica, RISC report 97-02, January 1997, University of Linz, Austria. Mohamed Hamada and Aart Middeldorp, Strong Completeness of a Lazy Conditional Narrowing Calculus, Proceedings of the 2nd Fuji International Workshop on Functional and Logic Programming, World Scientific, Singapore, 1997. Mohamed Hamada and Evsey Morozov, Queuing networks: regenerative analysis, simulation and ants-like approach, Technical Report B2003-1-005, The University of Aizu, 2003. Doctoral thesis, University of Tsukuba, Tsukuba, Japan, March 1998. Master thesis, Ain Shams University, Cairo, Egypt 1993.